Things are really popping in the garden and greenhouse. In fact, each day now brings new joys with blossoms, the beginnings of fruits and sunny days. We are getting good amounts of rain, yet not too much like 2009 and 2010, where there was a lack of sunshine and heat that really slowed things down. Or, never gave things a chance to get going if you want to look at it that way. That’s just not what we need when we officially average 92 frost free days! Not since 2008 have I seen an abundance of bumble bees like this year. I’m not talking about our honey bees, but the big happy fuzzy ones that come out when there is more heat. Not being the expert, just the observer, I say that this was my first hint that we were going to have a warmer summer. So far, so good. 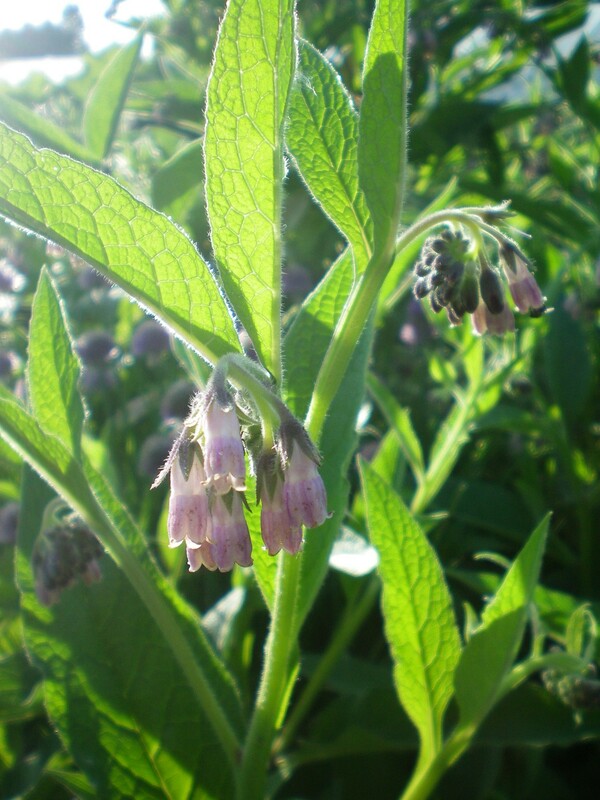 Speaking of those happy hard working little creatures, I learned this year that they love comfrey blossoms! (What’s not to love?) What fun to quietly stand by and watch them bumble by without a nod or so much as a hi. That’s ok. Being a die-hard fan of the whimsical and retro, the garden area is taking on a personality of it’s own. 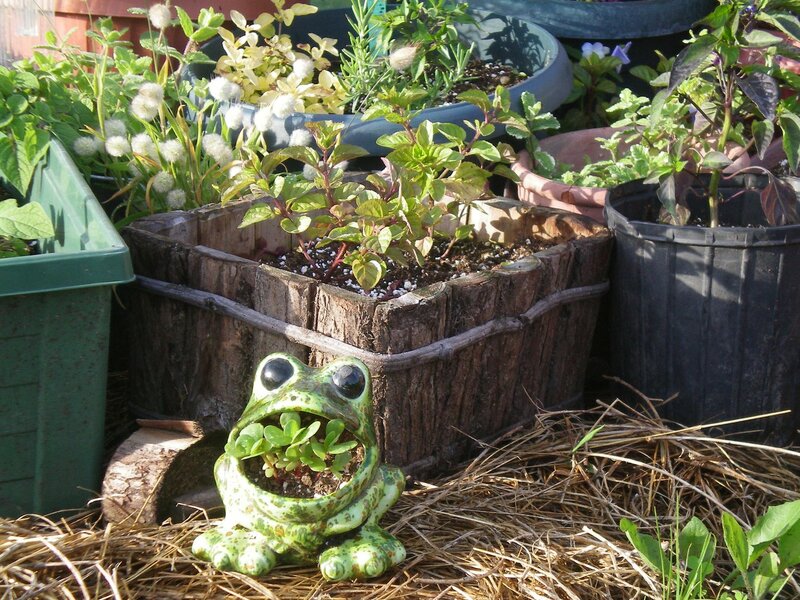 I guess I have a thing for garden frogs, both of the decorative persuasion and real live ones. Our garden is blessed with lots of happy little frogs, I have to be careful not to step on them as I go about. When I was looking for a pot for my golden purslane (yes, I did really grow it on purpose) I thought it would be fun to stick it in my retro scouring pad holding froggie. I figured dry and hot were good conditions, and judging from the comparison between that and the seedlings planted in a larger pot, I was right. Talk about a microclimate, lol! The tomato trials are going well, there’s lots to tell on that front, so it deserves its own post. More on that soon. 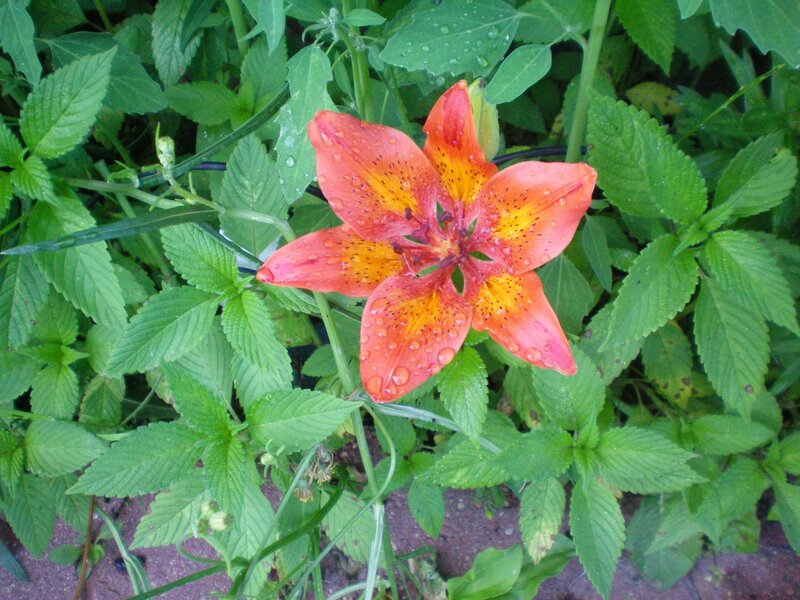 In a forgotten garden bed, where weeds have flourished, a lily bursts into bloom! I will be cleaning out this bed and its pair on the other side of the steps when I paint the deck in a couple of weeks. It’s sooooo bad that I think before and after pictures are in order! Later today we will go into town to the Canada Day celebrations. We have prime seats for the fireworks tonight. It’s overcast and breezy today, hopefully there will be no rain at fireworks time. Big River really puts on a great show! I hope everyone enjoys their Canada Day holiday!